Although "Echoes" is my favorite song (both by Pink Floyd and in general), "Shine On You Crazy Diamond" seems to be appropriate for me this weekend. Flashback to the day that my childhood cat (Janet) was buried back in 1998, Edz and I were jamming with a guitar player, and when I came back down from burying her in the side yard - my parents were there, too - we launched into an impropmtu but heartfelt version of the song. This is not that version, which probably wasn't recorded. 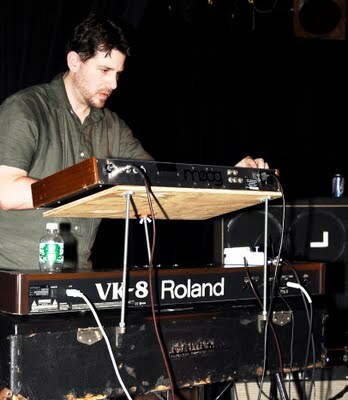 For the bulk of 2008, I played keys in a Pink Floyd cover band named "Us Not Them," before I made the decision to return to school and realized I wouldn't have the time to continue it. While it's true that the band's focus on later material was not mine and their approach to the earlier material (which I love) wasn't quite the feel I thought it should be, the band was full of talented and dedicated musicians. I felt badly about leaving, but as it turns out, my financial circumstances in 2009 would have warranted it inevitably. This particular set featured all of the Wish You Were Here album, but I've just edited together the two halves of "Shine." I'm not 100% thrilled with some of the keyboard work, here - I didn't have quite as much time as I would have liked to get my parts together - but what the heck. It was my first real experiment with playing three keyboards at a time, in the progressive rock fashion, a fetish of mine ever since I first saw the inner sleeve image of Rick Wakeman from The Six Wives of Henry the Eighth. It's stressful and fun to add that layer of bouncing around from setting to setting and from keyboard to keyboard, suddenly adding the Y-axis to what's normally the straight line of keyboard playing. Like the equivalent of Spock's 3D chess, only I was a novice, rather than a grandmaster. At any rate, with yesterday's death and subsequent burial of Kiko, this came to mind. Enjoy.